Argon gas is used as the shield gas in TIG welding. TIG is an acronym for Tungsten Inert Gas, and it’s called this because the heat source is electrified tungsten, and the weld is shielded from the air by an inert gas, argon gas, meaning the gas is not flammable or corrosive, and it prevents oxidizing. If either the melted filler material or the metal being welded is allowed to oxidize, the weld will fail. Tungsten is the material used to make the filaments in incandescent light bulbs. It gives off both light and heat when electricity passes through it. The electrode in a TIG welder is considerably more massive than a light bulb filament, so it’s able to generate a steady heat source of up to about 11,000 degrees Fahrenheit, to melt the filler material used in welding. The length and diameter of the electrode, and the type and amperage of current applied determine its heating characteristics, and different electrodes are appropriate for different applications. The third component in TIG welding is the filler material. Filler material comes in a huge variety of compositions, because the filler has to be made of material that will “stick” to the specific metals you need to weld together. Filler also comes in different diameters, to correspond with different thicknesses of metal to be joined. Keep it clean. Be sure there is no dust, dirt, mill scale, or other FOD (Foreign Object Debris) on your welding surface, and that the metal is free of grease and oil, and completely dry. Check that there is no oxidation on the metal surface. Grind it off, brush it off, wipe it off…be sure it’s perfectly clean before you start welding. Shields up! First, the argon gas flow is turned on, to form a protective cone around the area to be welded. The compressed gas is supplied by a canister or by a hose from a larger tank, and flows out through the tip of the welding torch. Crank up the heat. The next step is to activate the power supply that passes electricity through the electrode. The welding unit usually has a foot pedal to switch the arc on. The welder holds the torch in one hand, and the filler material in the other; TIG welding does not automatically feed the filler, it’s done by hand. Melt down. Once the heat is on, the metals begin to melt, and form a tiny puddle. The welder keeps the heat source and argon shield over the area surrounding the puddle, while pushing the puddle with the filler material, along the joint, to lay the weld in place. Watch your back. Most TIG welding units feature a post-flow feature, which keeps the argon gas shield flowing over the new weld, so it stays protected as it cools. This helps prevent failed welds, which happen when one of the metals oxidizes as it melts or cools. Welding aluminum. TIG welding is the best way to weld aluminum, which is very sensitive to corrosion and oxidizing during welding. Critical weld joints. Since TIG welding gives a continuous joint (unlike spot welding, for example), and because of the shielded weld process, TIG welding is an excellent choice for applications where failure is simply not an option. You’ll get a good, solid weld that will last. Variety of metals and mixed metals. For welding metals other than common steel, TIG is the most common choice. For joining dissimilar metals, it provides the best protection against the increased corrosion that often happens when the joint of two metals is exposed to moisture in use. Precision and beauty. Because the filler material is applied by hand, TIG welding offers the most precise control possible (at least, for a practiced welder), and the joints it produces are smooth and pretty, so it’s an ideal choice for applications where aesthetics count. If you need help selecting the correct filler for your project, or you need help troubleshooting a welding project, we can help. 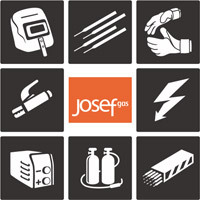 When you call Josef Gas, you’re speaking to someone who is an experienced welder, not just a gas salesman. Give us a call at 416-658-1212, we’re glad to help!